Welcome to the next stop on Magical Blogorail Red. Today we are sharing our experiences, tips and info to help you runDisney. In 2014, we joined the runDisney craze. We weren’t runners before, but now we have two runDisney race weekends under our belts and thinking about doing some more. As beginning runners, we wanted to share some of the things we’ve learned about running Disney. 10. Pick the Right Race. If you’re new to running, it’s probably best to start small. Beginners can get their feet wet with a 5k or 10k before moving up to Half and Full Marathons. There are several runDisney races throughout the year at both Walt Disney World Resort and Disneyland. You may want to run a race through a particular park, or one that has a particular theme or rewards you with a really cool finisher’s medal. Or perhaps the race just happens to fall right around a milestone in your life, such as a birthday. Picking the right race for you can help you stay motivated and on track. runDisney race registration opens up months before each individual race and many sell out very quickly. 9. Use a Training Plan. Once you’ve decided on a race to run, take some time to figure out a plan. It will make it easier to stay motivated if you’ve got a clear plan to follow. There are a number of apps and online guides for any skill level and race length. You can easily customize these plans to fit your schedule and running approach. A popular program for beginners is the Couch to 5k. It’s designed to take you from absolutely no running experience whatsoever to completing your first 5k race. The Jeff Galloway run/walk approach is also very popular with runDisney participants. You can find more information on Jeff’s training plans on the runDisney website. 8. Don’t overdo it right before the race. Many runDisney races start very early in the morning. It’s tough to resist staying at the parks until closing, but it’s a good idea to call it an early evening the night before so you can get your rest. Getting back to your resort after midnight and having to wake up at 3am to catch the bus to the staging area is no picnic. Another benefit of following a good training program is that it helps you identify the effects of running you may be susceptible to. It is very common for runners to deal with soreness, tightness, or chafing during runs. Be sure to bring with you anything you may need to use before, during, or after the race to alleviate these issues and help with recovery. If there are items you’ll want to have immediately after the race such as a change of clothes and shoes, or anything else, make use of the bag check. During training you have the luxury of postponing a run due to unseasonable weather, but come race day you want to be ready for whatever mother nature throws at you. We ran a Half Marathon in the rain. We didn’t opt for ponchos on the course, but having one for after or even a change of clothes might have helped. runDisney participants love to show their DisneySide on the course. Outfits range from subtle touches to full costumes. Whether you’re fitting the theme of the race or just paying homage to a favorite character, dressing up can help get you into the spirit of a runDisney race. For more elaborate costumes, it’s a good idea to test run with it before the big day. You want to make sure everything is comfortable and safe to run in. Drink plenty of water in the days leading up to the race. Being properly hydrated can help avoid cramping up during the race. Your training runs can help you gauge how your body feels when you’ve had too much or too little water. Concentrate of water in the days leading up to the race, and save the other drinks for after. If you’ve followed a training plan, you’ll have a good idea of your pace. Don’t worry if other people are passing you. Run Your Race. Listen to your body and use walking breaks when needed. Having a buddy to run with can make this easier. This could be someone you know, or it could be someone you meet at the race! 3. Did we mention hydrate? runDisney participants come from all over. Many, like you, may train in weather that is far different than the typically warmer and more humid climate of Florida, or the dryer heat of California. That’s why it’s so important to not only make sure that you are properly hydrated before the race begins, but also during. We recommend not passing up any of the water and sports beverage stations set up along the course. For longer races, you’ll also need to fuel your body for energy. Some running fuel stations are available on the course, but you should test out different energy snacks as part of your training to find out what works best for you and bring some with you to the race. 2. Have Fun and Enjoy it! runDisney races are unlike any other races on Earth. Be sure to savor every bit of it. Be sure to visit the expo, to talk to other runners, to take pictures and to enjoy yourself. Even if you’ve been to Disney a million times before, you’ll see the parks in a whole new way when you are running through them. There will be unique character meets and entertainment along the course. You’ll run through backstage areas and see things most guests never get to see. Most of all, you’ll be cheered on nearly every step of the way by the many cast members, volunteers, and ChEARing squads that come out in droves to support not just their runners, but everyone on the course. Crossing that finish line is an amazing achievement. Wear your medal proudly and be sure to show it off. Wearing it to the parks that same day or for the rest of the trip will get you lots of “congratulations” greetings from guests and cast members. Be sure to get some pictures showing off your hard-earned bling! You can also reward your body with a great meal at one of Disney’s many great restaurants. There are so many ways to celebrate, so don’t be shy about it! Previous Post: « A Magical Disney Vacation…in only 6 steps! What fabulous tips! I especially like that you added the one about hydration twice. I'm sure that one is important and I would likely forget – like I often do in the parks on a hot day. Thanks for sharing! Hydrating is so important. I had a health scare after my first race most likely due to dehydration. I definitely learned my lesson and drank as much as I could both before, after and during the half marathon. Great post! 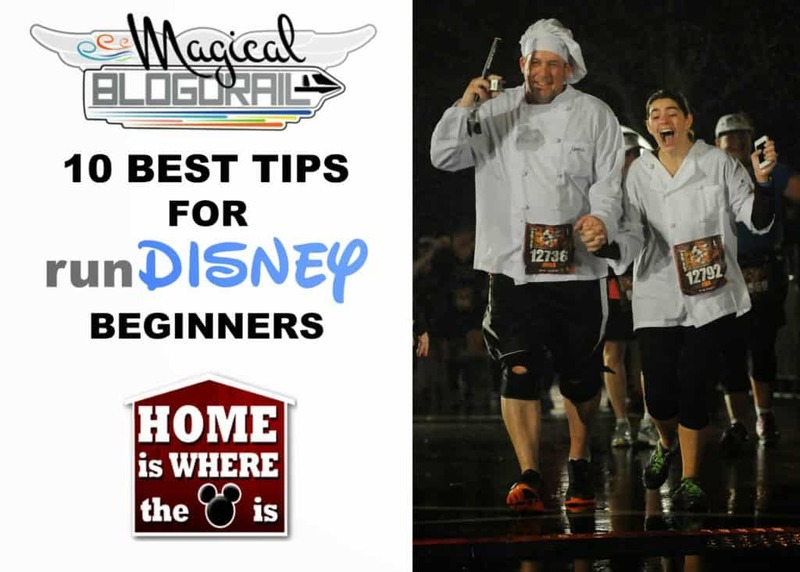 Thanks for sharing some great tips for me — especially since this will be my first runDisney 5K! I'm very excited for it to get here, and your post just made me that much more excited! I'm hoping you have great weather so you'll be able to see as many characters and exciting things as possible. My favorite part of runDisney races is being able to run in places I never get to go in as a Guest. It's amazing! Yes, I totally agree! Be proud to wear your bling. It's a symbol of a major accomplishment. After the half I would have worn that medal to the airport and all the way home if they let me. I worked for that baby! I can't tell you how much I love that photo of you and James from this past year's Disney Wine & Dine Half Marathon! That would be motivation enough for anyone still on the runDisney fence. Your tips also are sure to help nudge newcomers. Orlando humidity is a killer and you are so right about hydration; electrolyte replacement and some salt are also a must because we sweat out all the good stuff! I sure hope we get to run together in the future. Happy training! As soon as I saw the finish line on the horizon, I started to cry. It was a tough race and in the rain to boot. I was that kid who was the slowest in class and was often made fun of it because of it and here I was finishing a half marathon. The feeling was unbelievable. I hope to run with you someday too! Great tips! My son and I are considering starting to train for a runDisney event & I'm so nervous that I wouldn't make it across the finish line that I appreciate your #2 tip "Have Fun and Enjoy it!" What a great list of tips! I will have trouble with #8.. how do I go to WDW and not hang late at the parks!! going to be tuff! and # 7 I didn't know you could do (bag check) I will have to ask my friend about that 🙂 What made you run that first Disney race – not being previous "runners"? It is hard to leave, but it has to be done! I can only speak for myself, but I really wanted to try something different. I'm not athletic and didn't have a fitness routine. James was training for his first runDisney race and I thought "Hey why not". If I was going to do any race, Disney seemed like a great place to start. Great tips! My husband ran his first half at Disney and all of your advice is spot on. Hopefully we'll see you guys at a runDisney event in the future! I'm a newcomer and I really need to do this…and this is very simple and motivating! It may be a good post-pregnancy workout!